Be ready for the bugs but if you aren't the Boo-boo stick might be needed! This deal gets you one of each. Cajuput, Lemon, Geranium & Cedarwood in Fractionated Coconut oil. This is a 7% blend and is MIXED FRESH! This recipe is proven, by many, including us as we live deep in the woods of Minnesota. We know we need to repel all those nasty mosquitos and other flying bugs. This formula has been used for several years when we are in the woods, outdoors doing things like camping, hiking and fishing. Simply Spray a small amount to the areas of exposed skin and rub on gently. Don't forget you can put a small amount on your hands rub them and pat your hair. This will help to keep the pests away from your head. Really, the bugs will leave you alone with this formula! I usually enjoy yard work but not at this time of the year due to the "gnats"..
Today was a day that I would have been engulfed in them..(cloudy, no breeze)..I just came in from mowing and doing all of the weed eating and actually enjoyed it.. 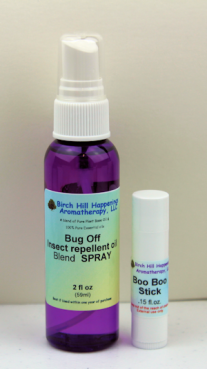 I recently purchased a bottle of your "Bug Off"..Used it for the first time today.. I haven't looked to see what is in it.. I don't care what is in it.. I was not bothered with ANY insects.. This stick is easy to apply a little bit of relief on those Mosquito Bites, Paper Cuts, little scratches and other little 'oweees'. It is easy to dab a tiny bit of this salve on so the healing can begin! It is a blend of several essential oils. 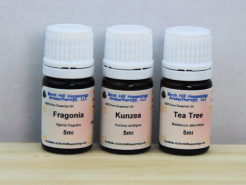 As you know, most all essential oils have anti-bacterial, anti-fungal and other germ fighting properties. When creating this blend we also wanted to include essential oils that would 'stop the itch'. So anti-histamine properties were found in several of these oils too. And last but not least we needed it to provide a little bit of relief from mild pain and irritations. So, essential oils with those properties were also included. OH, and it had to smell -not like medicine. INGREDIENTS for the Boo-Boo Stick Balm: Castor Oil ( Riccus communis ), Coconut Oil (Coco nuciferus), Jojoba (Simmondsia chinesis ), Bees wax (Apis Melifera ) and the essential oils of Lavender, Helichrysum, Tea Tree, German Chamomile, Thyme and Oregano. I think I did the best I could, simply dab a tiny amount on cleaned (wash the skin and dry it) small little wounds. You know, mosquito bites, other bug bites, the ones that itch. Or how about at work - where you get a zillion little paper cuts. Brush up against something sharp and get a scratch - you know thorns and other pokey things in the garden! Be sure to pack one in your First Aid Kit, another in your Purse, car, etc Keep this one handy. It will be there for all your minor first aid needs!